Ladies and gentlemen, presented above, I give you the creepiest item I have found on eBay to date. I am sure there is worse out there, and that this just scratches the surface. I don’t even want to know what lays below that surface. While the whole point of this piece is to venture into the abyss, buying a dead man’s hair just seems a tad too far. I didn’t even know hair could last that long. The government must have made some special technology for Elvis to make hair last forever and they are waiting to tell the rest of us common folk about it. While this likely isn’t the weirdest thing you can buy online, I think that anyone who buys it should probably be put on a CIA Watch List just in case. Yet, I continue on, searching for eBay’s weirdest, creepiest, and sometimes coolest pieces of movie memorabilia. With the exception of the above item, this week was a surprisingly low key week. There were even a few people who were honest about the items they were selling. But that doesn’t mean that they still won’t try and overcharge you. This entry was posted in Uncategorized and tagged eBay, Elvis, Movie Memorabilia on February 26, 2014 by ian0592. Actor, writer, director, and producer Harold Ramis died earlier today in his home. He had been battling illness for a long time. He was 69. 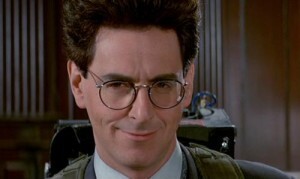 This entry was posted in Uncategorized and tagged Caddyshack, Comedy, Ghostbusters, Groundhog Day, Harold Ramis, Knocked Up, Walk Hard on February 24, 2014 by ian0592. Bow down to the almighty golden bald man! I mean this in the same way that sports are also like a religion, and the Super Bowl is its Christmas. If sports are the biggest religion, then cinema is a much smaller one, and one that you might have to be crazy to follow. Fittingly, movies are like Scientology. And it is ironic that the ceremony focuses on bowing down to a golden idol, given that the main participators are typically Jewish and idol worship is a no-no if you’re up to date with your Torah studies. I understand some of you are waiting to binge read it later. 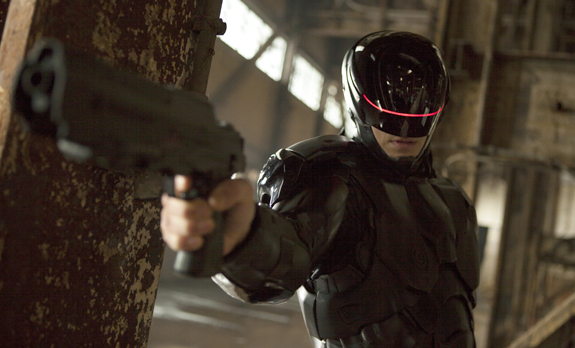 This year, the Oscars seem to have gone somewhat under the radar. Maybe it is because they are in March this year, or maybe it is because “The Lego Movie” distracted us all with its awesomeness. Either way, the Oscars are still happening this year, and I still have thoughts on them. 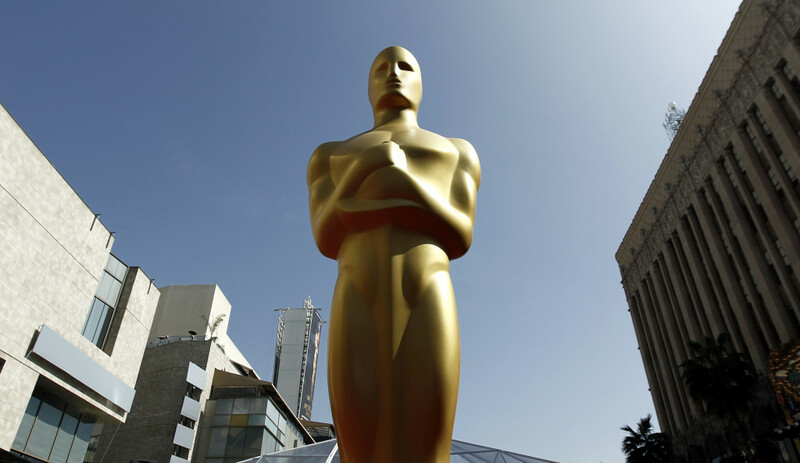 This actually happens to be a very exciting year for the Oscars. The ceremony will cap off a fantastic year of film and this year, there is an edge of unpredictability to it. Could there be a tie? 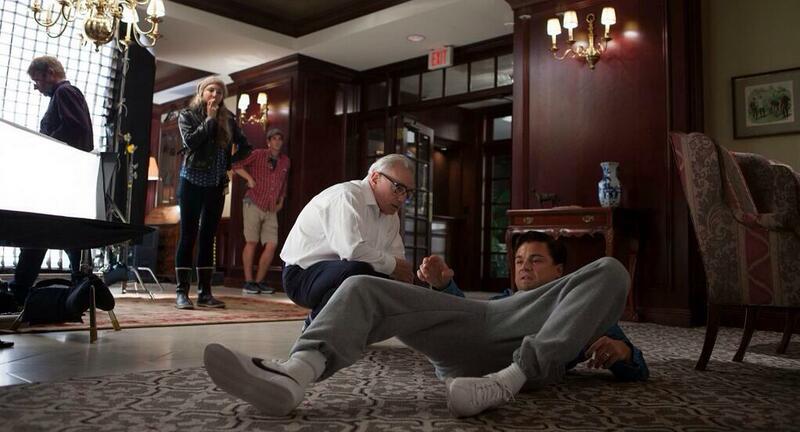 Could Leo finally win his first Oscar this year? Is Judi Dench the British version of Meryl Streep? Will I make more dumb religious analogies? I will try and answer some of these questions today. This entry was posted in Uncategorized and tagged Academy Awards, Oscars, Oscars 2014 on February 23, 2014 by ian0592. Today is a day that will live in infamy. It is the day that the Velociraptor Cage from “Jurassic Park,” which influenced this post, was no longer listed on eBay. It’s whereabouts, and the final price it was sold for, will remain shrouded in history. But you know what they say: if you love something set it free. So from that we move on to this week’s selection of memorabilia. Folks, this week did not disappoint. In fact, I found so many that I will have to save them for another post. I learned a lot from this week’s selection. Mainly that there are a lot of “Titanic” props on eBay. 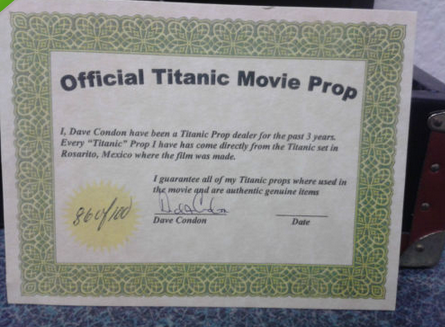 Enough so that being a “Titanic Prop Dealer” (as seen in the certificate above) is an actual job title that someone can have. Given what an epic film that is, I believe there will be no shortage of props until the day somebody finally begins selling off chunks of the actual boat. Seriously, the “Titanic” prop business is just about big enough that it could be listed on the NASDAQ. Also, let me just note that I have absolutely no idea what can get you listed on the NASDAQ; I just heard Walter White say this on “Breaking Bad” once and it sounded cool. This entry was posted in Uncategorized and tagged eBay, Movie Memorabilia, The Wolf of Wall Street, Titanic, Woody Allen on February 11, 2014 by ian0592.